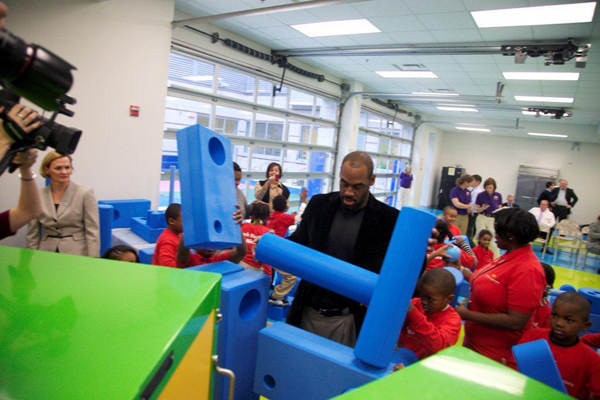 Washington Redskins Quarterback Donovan McNabb (below) joined Arne Duncan (left) and students from the KIPP DC charter school’s Benning Road campus to unveil the school’s new Imagination Playground™ in a Box, a breakthrough play system designed by architect David Rockwell. Donated by the John S. and James L. Knight Foundation, the innovative new play equipment system will help KIPP students unleash their imaginations when they play. “Intelligent people use information to create and discover new things, and one of the best ways to make children intelligent is to encourage creative play,” said Donovan McNabb. Added KIPP CEO/CAO Susan Schaeffler, "Play time challenges kids to think on their own, and helps them learn to be creative and think outside the box, how to work together, how there can be more than one answer, and how to engage their brains and really have fun, instead of just being entertained." KIPP DC is one of 14 community organizations to receive new play equipment thanks to the Knight Foundation as part of a national effort to engage residents in getting involved in their communities.